Craftspeople from the Heritage Crafts Association and QEST demonstrated an array of skills with opportunities for visitors to join in at the Carpenters’ Company on 9 May 2018. 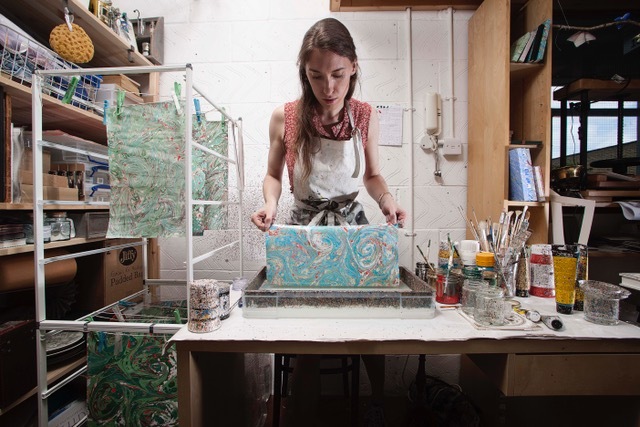 Demonstrators included 2017 HCA Maker of the Year fore-edge painter Martin Frost and 2017 Cockpit / The Arts Society Award winner paper marbler Lucy McGrath (pictured), both Red List critically endangered crafts. At 3pm furniture maker and designer John Makepeace OBE gave a talk on how he made the Master’s Chair for the Worshipful Company of Carpenters, followed by a champagne reception that provided a further opportunity to interact with these exceptionally talented makers.